In addition to bespoke ratchet strap assemblies, we sell standalone short narrow ratchet handle fittings which are ideal for repairing existing kit as well as creating new cargo straps. 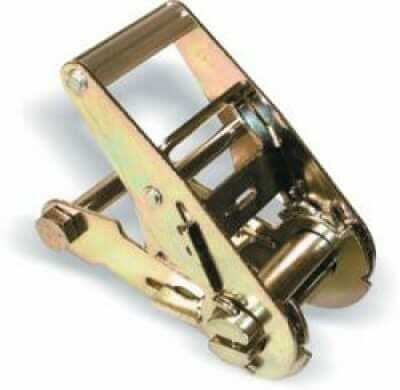 These handles are designed to fit pull-to-release buckle types, rather than their full locking counterparts. Whether you need to replace a worn out short narrow ratchet handle fittings on a ratchet strap system, or you want to create your own custom assembly from scratch, our site is the best place to buy affordable components to make transporting goods safer. We also provide short wide handle and long wide handle fittings, giving you even more choice. We test our short narrow ratchet handle products to make sure that they meet expected performance criteria in terms of strength and durability. If you need stainless steel handles for ratchet strap mechanisms, we can supply them at a competitive price point. Amongst the full array of ratchet strap fittings on our site, you will also encounter a number of hooks and delta links. Like our short narrow handle products, all of these accessories are built to a high standard and can be ordered in a number of shapes and sizes to match almost any requirements. The fastest way to work out which type of ratchet strap fitting is best for you is to call or email the Rope Services Direct team. Our telephone number is 01384 78004 and you can also reach us online. Short Narrow Ratchet Handle Fittings Overall rating: 5 out of 5 based on 6 reviews.